When you buy a pair of Jameson 2 Eco, La Reserva plants a tree. This helps rebuild the ecosystem and increase habitat for animals. Aptly, the Jameson 2 Eco is a totally Vegan Line. Canvas upper, soles made from recycled bike tires and rubber gloves, even the laces are made from plastic bottles. I think this is awesome. Etnies is doing a great thing by drawing attention to the fact that the reason rain forests are being torn down is for Animal Agriculture. They get integrity points for making the shoe Vegan for an environmental cause. I can think of so many companies that will give portions of monies to charities without fully explaining the whole circle and don’t have the consistency to make sure the product they are selling isn’t part of the problem. So not only do you get a decent animal free skate shoe, you’re doing your small part to help turn around the destructive forces of animal agriculture. 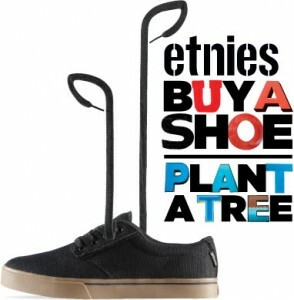 Get the Jameson 2 Eco direct from Etnies site from Kid size to Sasquatch Feet.